谢晨曦, 付小明, 徐凌, 胡娜. 基于解剖测量的比格犬下颌前磨牙区口腔种植位点的确定[J]. 第三军医大学学报, 2018, 40(14): 1279-1285. XIE Chenxi, FU Xiaoming, XU Ling, HU Na. Determination of insertion sites for dental implantation in the mandibular premolar region in Beagle dogs based on anatomical measurement[J]. Journal of Third Military Medical University, 2018, 40(14): 1279-1285. [Abstract] Objective To measure the length and diameter of the mandibular premolar roots and observe the anatomical characteristics of the healed mandible of Beagle dogs to determine the safe implantation region and adequate size of the implants for immediate or delayed dental implantation. Methods The premolars (P1-P4) of 10 male Beagle dogs (12 months old, weighing 10-12 kg) were extracted and the length and diameter of the roots were measured using a Vernier caliper. Three months later, the location of the mental foramen and the root apex of the healed mandible were measured. 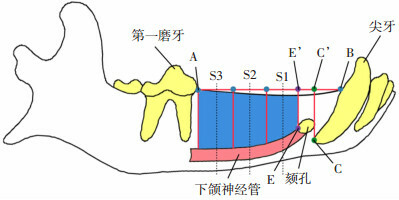 The canal-crest distance and the width of the alveolar ridge crest of 3 insertion sites in the safe implantation region that did not cover the canine teeth and mental foremen were determined. Results In the immediate implantation models, anatomical measurements showed that the length of the roots increased from P1 to P4, and the diameters of the distal roots of P2, P3 and P4 were slightly larger than those of the mesial roots, and the lengths of the mesial roots were slightly longer than those of the distal roots. For the single-rooted premolar P1, the root length was 7.65±0.39 mm and the diameter of the root cervix was 2.67±0.27 mm; for the two-rooted premolars P2-P4, the lengths of the mesial root were 8.78±0.34, 9.18±0.26 mm, and 11.18±0.42 mm, the diameters of the mesial root cervix were 2.72±0.23, 3.10±0.18, and 4.13±0.20 mm, the lengths of the distal root were 8.44±0.62, 8.67±0.45, and 10.90±0.37 mm, and the diameters of the distal root cervix were 3.02±0.20, 3.34±0.24, and 4.53±0.26 mm, respectively. In the delayed implantation models, anatomical measurements showed stable locations of the mental foramen and the root apex [at (28.0±2.8)% and (34.8±2.7)% of the mandibular premolar region, respectively]. The canal-crest distances of the 3 insertion sites (H1 to H3) in the safe implantation region were 7.22±0.70, 8.19±0.73, and 9.16±0.67 mm, and their corresponding widths of the alveolar ridge crest were 5.33±0.50, 5.83±0.57, and 6.39±0.57 mm, respectively. 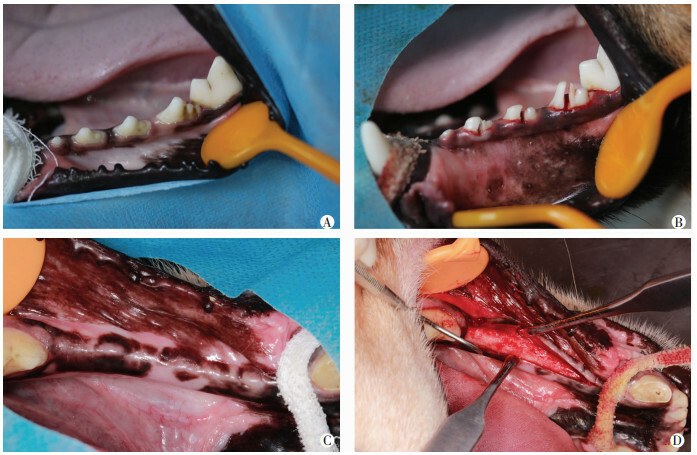 Conclusion In Beagle dog models of immediate or delayed dental implantation, the P1 site is not suitable for implant insertion in the mandible. For delayed dental implantation, the safe premolar region is between the mental foremen and the first molar. We recommend that the implants with a "short" (6-10 mm) or "extra-short" length (≤6 mm) and with a "narrow" (3.0-3.75 mm) or "extra-narrow" diameter (< 3.0 mm) be used for immediate or delayed dental implantation. 鲍济波, 谢志刚, 张燕, 等. 口腔种植体Beagle犬动物模型的建立[J]. 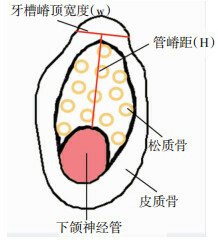 中国口腔种植学杂志, 2012, 17(2): 58–61. 刘逆舟, 陆尔奕. 犬动物模型应用于口腔种植的研究进展[J]. 临床口腔医学杂志, 2011, 27(11): 700–702. 刘雯, 胡赟, 邓锋, 等. 比格犬下颌骨微种植体的置入部位和方法[J]. 中国组织工程研究与临床康复, 2011, 15(41): 7635–7638. 王磊, 黄远亮, 潘可风. 实验性种植体周围骨缺损动物模型的建立[J]. 中国组织工程研究与临床康复, 2009, 13(33): 6561–6564. 吕影涛, 徐平平, 元佩燕, 等. Beagle犬后牙解剖特点与微螺钉种植体植入部位的相关研究[J]. 华西口腔医学杂志, 2011, 29(3): 264–267, 271. 冯丽芳, 吴琳. 犬牙槽骨种植实验及种植体-骨结合评价方法[J]. 中国实用口腔科杂志, 2013, 6(8): 496–502. FENG L F, WU L. The evaluation methods of dental implant in canine alveolar bone and bone integration[J]. Chin J Practical Stomatol, 2013, 6(8): 496–502. XIE Chenxi, FU Xiaoming, XU Ling, HU Na.